MVC is the latest trend in web development. Our developers at Knila are on par with the latest trends and use MVC for web development. We thought that we would share our experiences in transitioning from ASP.Net to MVC so that would benefit the readers who are looking to transition to MVC. Web applications can be developed using ASP.Net webforms or ASP.Net MVC. The faithful and the old one is ASP.Net whereas the young and smart framework is ASP.Net MVC. Using the ASP.Net is easy for the developers to transit windows developer into web development. Though this technology has brought the Rapid Application Development growth in the tech market, in order to modernize the complex projects, the developers started migrating from ASP.Net to ASP.Net MVC. MVC stands for Model View and Controller. It is one of the latest and tech-friendly web development framework used widely to create the scalable and extensible projects. ASP.Net MVC has a lot of technical goodies that enables the creation of stable and reliable web applications. Maintaining the application is very easy with MVC as the application architecture is broken down into individual components and changes made to one component will not impact the others. When To Create An MVC Application? As a web developer, this is quite important where you must consider carefully which one to be implemented. whether ASP.Net webforms or the ASP.Net MVC framework. The choice is yours but before you decide, weigh the advantage of each approach. 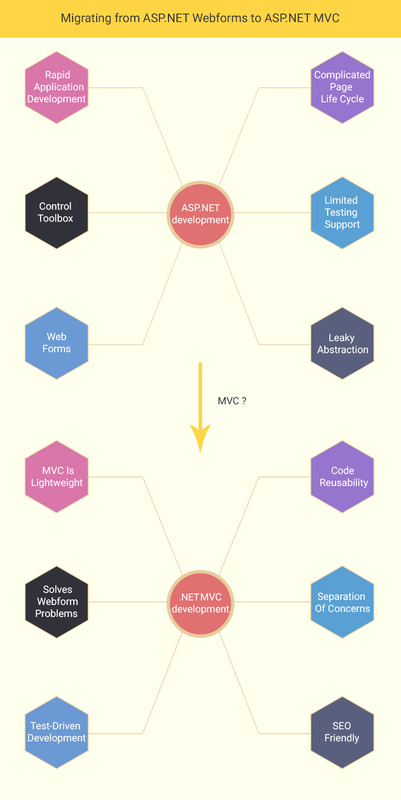 We would like to suggest you few important points and when to use MVC framework in your application. Provides clean separation of concerns. It works well for the large web applications that are supported by large teams of web developers and the designers who need the control over the application behavior. Moreover, it is pluggable architecture. It is SEO friendly as you can control the URL and the HTML to a greater extent. Without MVC framework the code handling would be difficult task with the above responsibilities. Thereby our developers at Knila are fond off MVC framework and has made transition from ASP.Net to MVC framework. Do you want to know what are the queries rising from many web developers when moving from ASP.Net to MVC framework? Even you could create your MVC applications accordingly and update your skills with the latest technology that adds an advantage to your technical skills. If you have already upgraded your skills, then share your experience with us.